There comes a time in every boy’s life when he has a raging desire to go somewhere and dig for hidden treasure. 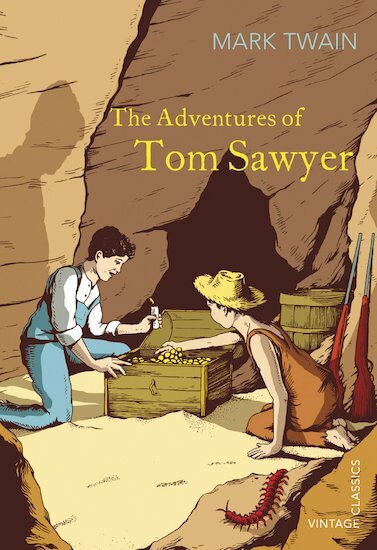 Impish, daring young Tom Sawyer is a hero to his friends and a torment to his relatives. Wherever there is mischief or adventure, Tom is at the heart of it. During one hot summer, Tom witnesses a murder, runs away to be a pirate and attends his own funeral. He saves an innocent man from the gallows, searches for treasure in a haunted house, foils a devilish plot and discovers a box of gold. But can he escape his nemesis, the villainous Injun Joe? Mark Twain is brilliant! This book is so clever and fun to read. The characters (both the heroes and the villains) are great. Everyone would like this story!